Apparently I cannot read poetry. My mind wanders when I read it silently, I break down in giggles when I read it aloud. Which is a shame because this book is very special to me. Seeing Lessons has a place in my heart because of the memories that it will always carry. 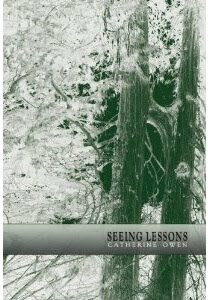 This past October, during the trial run of BlogCon, the willing victims conventioneers attended a couple of Word Fest events, one of which featured the Vancouver poet and heavy metal musician, Catherine Owen, reading from this book. I wish she would come over and read all the poems in her book to me, because poetry really needs to be read to you. Especially the way she does it. Catherine Owen was fascinating to watch. Her musicianship was very telling in her unconscious hand gestures, one hand keeping time with the rhythm of her words as she read. I tried doing that myself as I read these poems aloud, but it just made me giggle all the harder. I am no heavy metal poetess. Seeing Lessons was born of Owen's fascination with an entry she came upon in the scholarly tome, A History of Women Photographers: "In 1927, Mattie Gunterman's large body of work was destroyed by fire". Her poet's imagination fired up, she uncovered all the information she could about Mattie Gunterman, the American woman who, carrying cameras and developing equipment with her, walked from Seattle into the BC interior, to work as a camp cook and settle a homestead near Beaton. A mixture of Owen's poetry about Gunterman's life, some of Mattie Gunterman's few remaining photographs, and many of Gunterman's letters and journal entries, Seeing Lessons is a powerful and often poignant glimpse of a strong woman, not bowed by hardship and tragedy, a woman whose surviving work is an important chronicle of the history of a nation. Because of my illiteracy when faced with poetry, it took me several months to read this book. I breezed through the chapters containing Gunterman's letters and journal entries and obviously had no difficulty with the photographs. But although I was forced by my own shortcomings to read the poems at a snail's pace, I can recommend this book to anyone with an interest in poetry or photography or Canadian history or women's studies. You will never be able to share my memories of watching with admiration as your dear friend engages a poet in conversation at a downtown Calgary art gallery on a snowy day in October, but you can uncover the fascinating elements of the book that sparked their discussion. I used to read more poetry than I do now. These days I prefer novels, although in the past few months I haven't read nearly as much as I have in other years. I find I am reading more and more non-fiction these days, Mr Anchovy, which rather surprises me. "obviously had no difficulty with the photographs." You read like I do! The best way to read poetry is to hear it in your head in someone elses's voice. Try reading it in the voice of your mother, a news anchorman, or Richard Nixon. It helps add flavor to the poetry. She had such a fabulous voice! I try to recall it when I'm reading it too, but can never capture it. I need to reread this book, thanks for the reminder! Richard Nixon, brilliant! His voice shall forever be my de facto poetry reading voice, Doc, for better or for worse. She did have a great voice, Al, and such wonderful rhythm. I loved how she kept time with her hand. I can't read poetry aloud either, though plenty of poets suggest that we should. Taking your time isn't a bad thing and I don't think it highlights your shortcomings as much as rushing through a collection highlights mine. I believe that there are really only two speeds at which one can read poetry, John - breakneck or snail. I won't make any comparisons to removing bandages, although watching me read poetry can be pretty painful.